Not to be confused with Bowie, Texas. 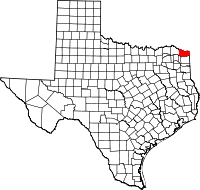 Bowie County (/ˈbuːi/ BOO-ee) is a county in the U.S. state of Texas. As of the 2010 census, the population was 92,565. Its legal county seat is Boston, though its courthouse is located in New Boston. The county is named for James Bowie, the legendary knife fighter who died at the Battle of the Alamo. 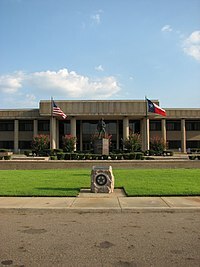 Bowie County is part of the Texarkana, TX-AR Metropolitan Statistical Area. Bowie County is no longer one of the seven dry counties in the state of Texas. Both the city of Nash and the city of Texarkana (on November 6, 2013 and November 5, 2014, respectively) have since passed laws to allow the sale of beer and wine. The farming Caddoan Mississippian culture dates as early as the Late Archaic Period 1500 BCE in Bowie County. The Hernando de Soto expedition of 1541 resulted in violent encounters. Spanish and French missionaries brought smallpox, measles malaria, and influenza epidemics against which the Caddo had no immunity. Eventually, these issues and problems with the Osage, forced the Caddo to abandon their homelands. Settlers had peaceful relations with the 19th Century Shawnee, Delaware, and Kickapoo in the area. French explorer Jean Baptiste Bénard de La Harpe founded the military fort Le Poste des Cadodaquious in 1719 . The fort remained in continuous use until 1770. The Red River Expedition of 1806 which passed through Bowie County, headed by Thomas Freeman and Dr. Peter Custis, was of great diplomatic and economic importance to President Thomas Jefferson. Bowie County was established in December 1840 and named for James Bowie, reduced to its present size in 1846. DeKalb was the temporary county seat, with Boston becoming the permanent county seat in 1841. Bowie County in the years leading up to the American Civil War was settled mostly by Southerners who brought their slave labor to work the cotton fields. By 1860, slaves outnumbered whites 2,651 to 2,401. The county voted 208-15 in favor of secession from the Union. While Bowie was never a battlefield in that war, it was nevertheless occupied during Reconstruction. Between 1860 and 1870, the population declined. The occupation, and the new legal equality of blacks, became a hostile situation that fostered Cullen Baker. Cullen Montgomery Baker (b. circa 1835 - d. 1869) was a twice-widowed, mean-spirited drunk who killed his first man before he was 20. When Thomas Orr married Baker's late wife's sister, thereby denying Baker that opportunity, Baker attempted to hang Orr. Legends abound as to his activities in both Bowie and Cass Counties, including a rumored tie to the Ku Klux Klan. His exploits turned him into a folk hero dubbed "The Swamp Fox of the Sulphur River". He was a Confederate States Army veteran who joined two units, designated as a deserter from the first, and receiving a disability discharge from the second. Reconstruction enabled him to focus his anger towards what many at the time believed was a Union intrusion into their lives. Baker and his gang conducted a vicious rampage against citizens he perceived as being on the wrong side of the black labor issue, at William G. Kirkman and the Freedman's Bureau in Bowie County, and at the soldiers of the Union occupation. Kirkman unsuccessfully pursued Baker, killing one of Baker's men in the second attempt. Like Swamp Fox Francis Marion, Baker always managed to elude capture, often with the help of local citizens. Kirkland was murdered by "person or persons unknown", but Baker boasted of having done the deed. In December 1869, Thomas Orr and a group of neighbors killed Baker. A local legend has it that the deed was accomplished with strychnine-laced whiskey. When the Texas and Pacific Railway was constructed through the county, a new town named Texarkana was founded. Bowie was hit hard by the Great Depression like everywhere else. Measurable relief came late when the Lone Star Army Ammunition Plant was established in 1942. The base was active until 2009. The Red River Army Depot, opened in 1941, remains active. The two installations occupied almost 40,000 acres (160 km2) and provided job opportunities for thousands. According to the U.S. Census Bureau, the county has a total area of 923 square miles (2,390 km2), of which 885 square miles (2,290 km2) is land and 38 square miles (98 km2) (4.1%) is covered by water. As of the census of 2000, 89,306 people, 33,058 households, and 23,438 families resided in the county. The population density was 101 inhabitants per square mile (39/km2). The 36,463 housing units averaged 41 per square mile (16/km²). The racial makeup of the county was 73.26% White, 23.42% Black or African American, 0.58% Native American, 0.43% Asian, 0.04% Pacific Islander, 1.12% from other races, and 1.15% from two or more races. About 4.47% of the population was Hispanic or Latino of any race. Of the 33,058 households, 33.00% had children under the age of 18 living with them, 52.00% were married couples living together, 15.00% had a female householder with no husband present, and 29.10% were not families; 26.00% of all households were made up of individuals and 11.10% had someone living alone who was 65 years of age or older. The average household size was 2.50 and the average family size was 3.00. In the county, the population was distributed as 24.80% under the age of 18, 9.40% from 18 to 24, 29.60% from 25 to 44, 22.40% from 45 to 64, and 13.80% who were 65 years of age or older. The median age was 36 years. For every 100 females, there were 101.80 males. For every 100 females age 18 and over, there were 101.00 males. The median income for a household in the county was $33,001, and for a family was $41,108. Males had a median income of $31,883 versus $21,439 for females. The per capita income for the county was $17,357. About 13.80% of families and 17.70% of the population were below the poverty line, including 25.00% of those under age 18 and 12.40% of those age 65 or over. Barry Telford Unit, a Texas Department of Criminal Justice prison for men, is in an unincorporated area of the county, near New Boston. Federal Correctional Institution, Texarkana, is a Federal Bureau of Prisons facility in unincorporated Bowie County, near Texarkana, Texas. ^ "How to Pronounce: B Cities". texastripper.com. September 23, 2014. ^ Walsh, Field (November 5, 2014). "Texarkana, Texas Voters Approve Beer and Wine Sales - Texarkana Today". txktoday.com. ^ "DeKalb, Texas". Texas Escapes - Blueprints For Travel, LLC. Retrieved May 14, 2010. Texas Escapes - Blueprints For Travel, LLC. ^ "Boston, Texas". Texas Escapes - Blueprints For Travel, LLC. Retrieved May 14, 2010. Texas Escapes - Blueprints For Travel, LLC. ^ Anderson, Dale; Yadon, Laurence (2009). Ten Deadly Texans. Pelican Publishing. pp. 29–51. ISBN 978-1-58980-599-6. ^ Crouch, Barry A; Brice, Donaly E (1997). Cullen Montgomery Baker, Reconstruction Desperado. Louisiana State University Press. ISBN 978-0-8071-2140-5. ^ "Oakwood Cemetery, Grave of Cullen Montgomery Baker". Find A Grave. Retrieved May 14, 2010. ^ "Texas and Pacific Railway". Texas and Pacific Railway. Retrieved May 14, 2010. ^ "Texarkana, Texas". Texas Escapes - Blueprints For Travel, LLC. Retrieved May 14, 2010. Texas Escapes - Blueprints For Travel, LLC. ^ "FCI Texarkana Contact Information". Federal Bureau of Prisons. Retrieved June 2, 2010. ^ "Ward Map". City of Texarkana, Texas. Archived from the original on January 27, 2011. Retrieved July 2, 2010.